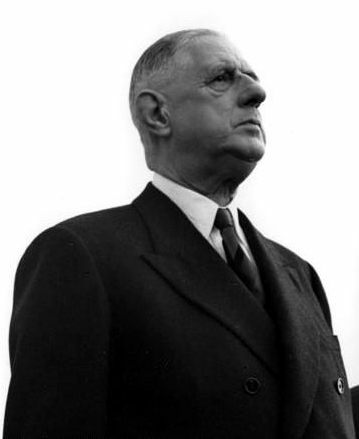 French President Charles de Gaulle in 1961. Step back a little further – to the French Revolution and the Reign of Terror. With Ted Cruz as Robespierre. Sarah Palin as Charlotte Corday and John Boehner as Marat. Schwarzenegger didn’t do any favors for California, hastening the Privatization of UC, allowing Big Agra to destroy the Delta Salmon population. Don’t forget that car-thief Darrell Issa is a CA Republican. The California GOP is pretty much off the deep end, and at the state level specialized in preventing governance, as they continue to do now in DC. Take Issa, McCarthy, McKeon, et al, for example. California agriculture needs the Farm bill to be passed in the house but California tea partiers refuse to budge. Same with comprehensive immigration reform. The California Farm Bureau is lobbying for it, but it appears that the Farm Bureau has lost its influence over the tea party. I think everyone pretty much understands what you are saying, but the tea party really is the straw that will break the camel’s back if it gets its way. Now, one could argue better now than later. We are already over the dam; we just haven’t hit the bottom yet. Regan, with respect, a short critique like Mr. Pillar’s usually focus on a single point or issue. Surely, the links you cite are important, no one can cover everything in a short piece. I don’t expect him to cover everything in a short piece, or even the issue addressed by my link. My point is that it’s dishonest and propagandistic to lay all the blame for the destruction of American democracy on one political faction when any objective observer can see the responsibility lies with the entire corporate-state establishment, be it Democrat or Republican, neoliberal or neoconservative. We get essentially the same elitist, anti-democratic policies. This article is clearly just a partisan hack job that really isn’t interested in arriving at the truth. It occurs to me that the Tea Party, aside from being retrograde delusional obstructionists, did accomplish one beneficial thing in their quest to bring medieval feudalism back into vogue…they made such a big deal out of the birth certificate issue that Ted Cruz and Arnold Schwarzenegger are unlikely to ever achieve a successful shot at the Presidency. By the way, there really is a sign of hope on the horizon – Bernie Sanders may run for President. Now if we could just get the Tea Party to support Hillary Clinton…oh well, I’m just a hopeless optimist. Mr. Sanford, you’re talking to yourself again. Yes…but at least I’m listening.